Try one of these fun & unique Valentine's Day ideas for kids! Growing up, my mother always had a surprise waiting for my siblings and me when we woke up to get ready for school on Valentine’s Day morning. She had heart shaped EVERYTHING decorating the house. It always put us in the perfect mood. Not only did she decorate, but she always found a way to slip something into our backpacks so we could remember the love she and our father had for us kids while we were away. I remember finding everything from heart-shaped cookies to little notes on napkins. Those are memories that I will never forget. Out of all the valentines I ever received growing up, the ones from my parents are the ones I remember the most. Now, I’ve come to terms with the fact that I’m not as awesome as my mom. It’s a different generation and I work full time from home and to keep up with everything she did is impossible for me. BUT that doesn’t mean I can’t make a little effort and spend a little time to make Valentine’s Day special. They won’t necessarily remember what you did for them, but they WILL remember how it made them FEEL. So I thought this list of Valentine’s Day ideas for kids would be helpful not only to me but to you too! Take a little construction paper and cut out some paper hearts! (Or just buy some!) On them, write all the things you love about your child. Before they wake up in the morning, tape them to their door. When they wake up to this surprise, they will be full of love and have the perfect start to their Valentine’s Day. As your child tiredly stumbles to the bathroom to take a shower before school, they will find this nice little surprise waiting for them. Just fill each sticky note with your favorite things about your child and help them feel the love on this special day. They will never forget this small act. This one takes a SNEAKY MOM, but it’s such a cute Valentine surprise! Before they wake up, sneak into your child’s room with 6-12 balloons. Tie little hearts with sweet little notes or their favorite candies tied to the end of each balloon and let them float above their bed. Make a cute little paper chain, grab a few balloons, and fill your back seat with a few love notes for your children. They will be surprised and so excited when they get in the car to head to school. This heart-shaped toast is super easy. Just toast the bread a little, cut out the heart, put the toast in a frying pan, crack the egg inside the heart, let it cook, flip it, and TA-DA! You have your heart egg toast! Also, you could pair it with a healthy spinach strawberry smoothie! Keep everything pink, red, or heart-shaped and your kids will be happy campers! Surprise them either before or after school with a scavenger hunt! Here are some printable clues and all you have to do is just set it up! You can add a few little candies here and there with each clue to make it even more fun. Once they finish, you can leave them a bucket full of their favorite things. It would be cute to add a few of their favorite candies, some pencils or pens, a few little toys, and a little love note from Mom & Dad. Thanks, Creations by Kara! This is SUPER easy and would make the perfect, inexpensive gift for your child. All you have to do is find a bunch of your child’s old crayons that he/she never uses and follow this tutorial. They will only take a few hours to make and you can pair this gift with a new Valentine’s color book! Thanks, My Frugal Adventure for the Tutorial! Glue it all together and you have yourself a book mark. You could even pair this gift with a new Valentine’s Day bedtime story book. This craft would be so fun to set up on your child’s dresser on Valentine’s Day morning. Just sneak into his/her room before they wake up, and leave him sitting on their dresser. You could even fill the inside of the cup up with their favorite treat. This is SUPER easy and SUPER fun. All you need to do is take one of your child’s old plain white t-shirts, grab a pencil, trace out a heart on some cardboard, cut it out, and place it on the shirt. Next, just grab some pink or red paint, take your pencil, flip it upside down, and use its eraser as your paint brush! Just dip the eraser in the paint and make little dots around the shirt. Once you’re done, remove the cardboard, let the paint dry, and you child has the perfect Valentine’s Day shirt! Here is a free download to a PDF full of cute little coupons to give your child. You can just give them the stack like this, punch holes in the top and put a string or ring in them to hold them together, or make a little book. Your children will LOVE these sweet little coupons. Thanks Catch My Party! Valentine’s Day Ideas For Kids on the Go! If Valentine’s Day falls on a weekday, your kids will spend the majority of their day at school. Here are a few ideas to help them feel your love while they are busy learning! My suggestion would be to use the orange or banana so they can just peel the message off and enjoy the fruit! This idea is so simple and thoughtful. You can just download the template, print it, and create your little goodie box or bag. All you need is a gift box or bag, some bakers twine or string, and something to fill your bags with. I would use either teddy grahams or gummy bears! You pick! This easy Valentines Day craft is so small that you can easily slip it into your child’s backpack and let them find a nice little surprise once they get to school. Huge thanks to Skip to My Lou! Rice Krispies are the one of the easiest treats to make and I’ll give you a few little hints to give them a nice Valentine’s Day twist. Instead of regular marshmallows, use Kraft’s Jet Puffed Heart Mallows (they are pink shaped heart marshmallows). That will give your treats a nice little pink tint! Also, use a heart shaped cookie cutter and place them in cute plastic bags before sliding them into your child’s lunch box! Maybe even attach a cute little note to the bag! Another fun way to help your children LOVE fruit! 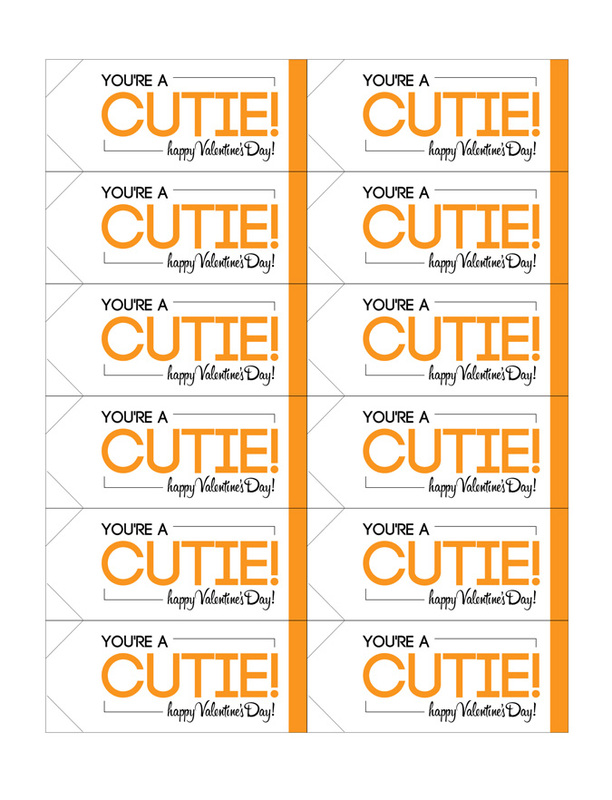 Download this free template, print it out, grab a Cutie orange, and just like that you’re done! Let your child know just how cute you think they are! Thank you It’s Always Autumn! Just dip the pretzels in the Candiquik then cover them with sprinkles while the Candiquik is still wet. Add a piece of a red sour straw and a conversation heart. Then, just draw on your smiley face (with an edible ink marker) and you have yourself a butterfly! Thank You Party Pinching! This could be my favorite one seeing that it’s my favorite candy, BUT, look how adorable this is! All you need are some watermelon sour patch kids, a plastic bag, some bakers twine or string, and this free printable template! I’m sure this little goodie bag would MAKE your child’s day! (And hey, you can even eat the extra candies!) Thank you for this one, My Frugal Adventure! Just preheat your oven to 250, place the pretzels with the rolos on top on the wax paper in a baking sheet and allow the pretzels and rolos to melt (takes about 2-3 minutes). Then take them out of the oven, stick a conversation heart on it, and let them cool! Bag a few of them up and add it to their sack lunch! Thank you Living Locurto! Hopefully, you find a few fun Valentine’s Day ideas that you’re kids will love. Try one of them out and make your child’s day. They will never forget your small act of kindness! And hey, it’s pretty fun planning out these surprises & celebrations. Give it a try! What do you love to do for your children on Valentine’s Day?